Join us in Thousand Oaks for an afternoon tour of four mid-century modern homes that feature Ocean Friendly Gardens followed by a locally sourced dinner sponsored by Slow Food Ventura County featuring Chef Pamela Nears. CLICK HERE for tickets. What’s an Ocean Friendly Garden? 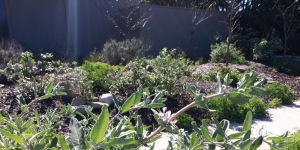 Surfrider Foundation volunteers will take you on a short walking tour to discuss how to design and build a garden that practices CPR: Conservation, Permeability and Retention. Slow Food Ventura County is our generous host for this event. In the Slow Food tradition, we will serve delicious light fare from local sources, prepared by chef Pamela Nears. Plus, we will have door prizes from Surfrider, Patagonia and local nurseries. This will be a fun social event to support the Ocean Friendly Gardens program! Ticket sales are limited, so don’t miss out! For more information about the Ventura County chapter of Surfrider’s Ocean Friendly Gardens program, click here.